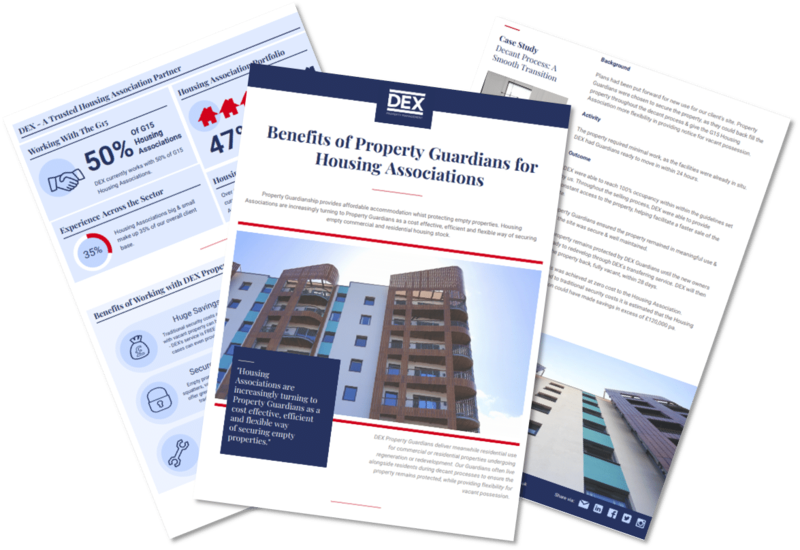 A new infographic by leading Property Guardian provider, DEX Property Management, illustrates the increasing use of Property Guardians by Housing Associations across the UK. Housing Associations, including many of the G15, are increasingly choosing Property Guardianship. This is because it offers a cost effective, efficient and flexible way of securing empty commercial and residential housing stock, undergoing regeneration or redevelopment. This evolving industry has undergone a facelift of late. The introduction of the Property Guardian Providers Association has seen an increase in standards and there is a growing confidence in the once ‘niche’ sector. This mutually beneficial service sees Guardians protect property against risk of vacancy, including squatters, vandalism and dilapidation. In return they get to live in unique property, often in great locations at a fraction of the market rate. The benefit for Housing Association is huge. Empty property remains in meaningful use, and the site is secure and well maintained. Property Guardians can be used to back fill a property throughout a decant process. Ensuring the property remains a pleasant place to live for other residents, at what can sometimes be a sensitive time. Placing Property Guardians can help facilitate a faster sale or redevelopment of the site. The property remains in constant use, improving its aesthetic appearance and protecting against dilapidation. Because Property Guardians sign a licence to occupy, they hold no tenancy rights & the property will remain on a monthly rolling contract which can be handed back fully vacant, within 28 days. This provides Housing Associations with more flexibility over providing notice for vacant possession. In addition, there are significant costs savings that Housing Associations are able to realise through Property Guardianship. Traditional security methods cost each property on average £60,000 pa. Property Guardians are provided at zero cost to the Housing Associations and in many cases can even provide a revenue. DEX Property Management is one of the most established Property Guardian providers across the Housing Association sector, we are partnered with 50% of the G15 Housing Association providers. As a result, DEX fully understand the intricacies and sensitivities of the sector and are able to tailor our service accordingly.